100% Fully Leased Neighborhood Retail Center located in Decatur, Georgia in a dense retail area. The center is located less than 0.4 miles from DeKalb Medical Hospital. The occupancy has always been stable, historically serving specialty medical related needs of the community. The Center is a part of the North Decatur Square Kroger Master Plan. The 172,300 SF Super Kroger Center has outparcels including the sale property, as well as the following National Tenants including Tires Plus, Chase Bank, MRI & Imaging of Dekalb, Walgreens, Burger King and Dollar Tree. The Kroger center includes Medical Clinic Primary Care Center, H&R Block, T Mobile, Starbucks Coffee and others. A new Super Wal-Mart is located 0.8 miles away and the Dekalb Farmers Market slated to be 500,000 SF is 0.5 miles away. 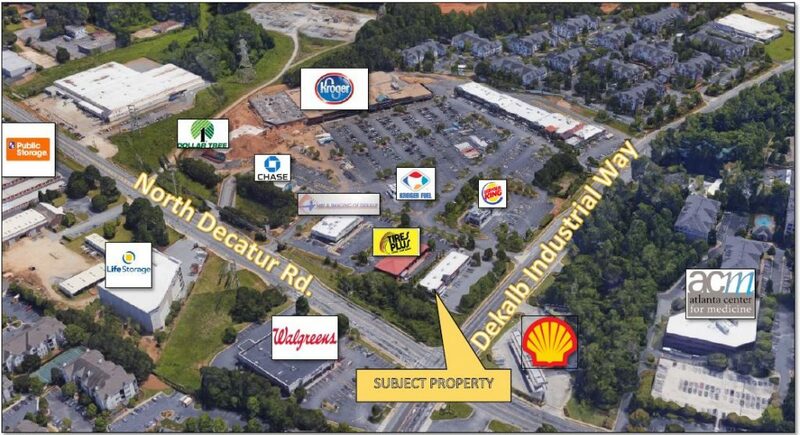 Additionally, the North Dekalb Mall is 1.4 miles away as well as many additional retailers.